So, gaming mice. There are about a Godzillion out there, and every last one of them is promising to make you a better gamer. The truth is, your mouse is a hygiene factor. That is, one that isn’t good enough will hurt you, but once you hit that threshold, further improvement won’t get you any real benefit. That said, there’s a lot that goes into “good enough” for a serious gamer, and many so-called “gaming mice” just don’t measure up. 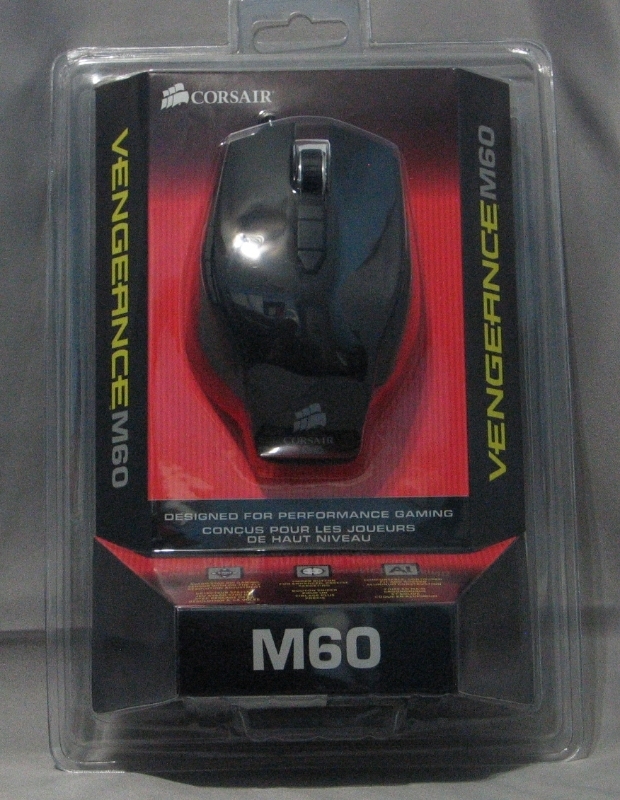 Today we’ll be taking a look at the Corsair Vengeance M60 mouse, and using it to examine what matters in a gaming mouse. No fancy multi-layered cardboard sarcophagus here, just a basic plastic clam shell that shows the mouse front and center. This approach also lets you get your hands around the mouse for a first approximation of the feel without opening it; useful if you find it in a bricks-and-mortar store rather than online. 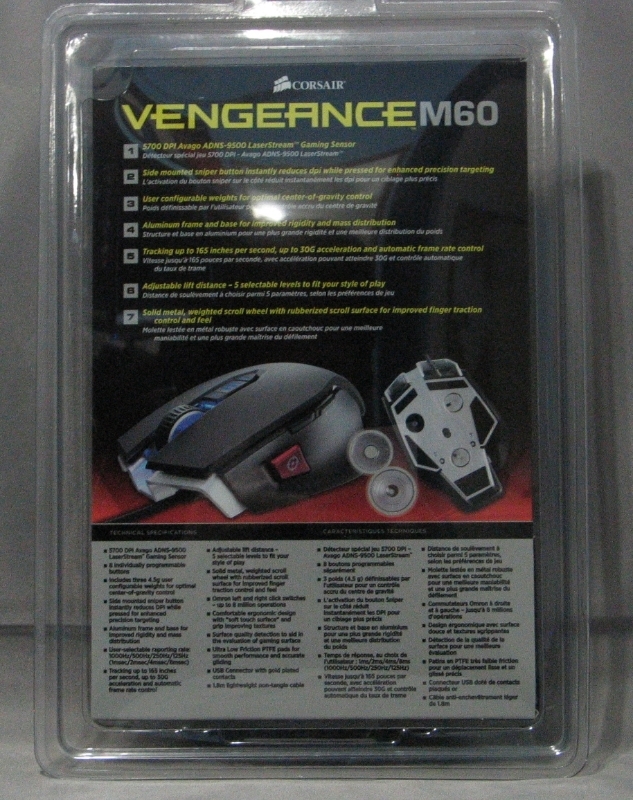 On the back, they list off some of the mouse’s features. The list is actually fairly comprehensive, but the need to print everything in English and French means the text is rather tiny. Not the most attractive result, but this is one of those problems there just isn’t a good solution for. The documentation is fairly spartan, as you might expect. There’s not much more there than Plug Mouse In, Install Drivers, Play. 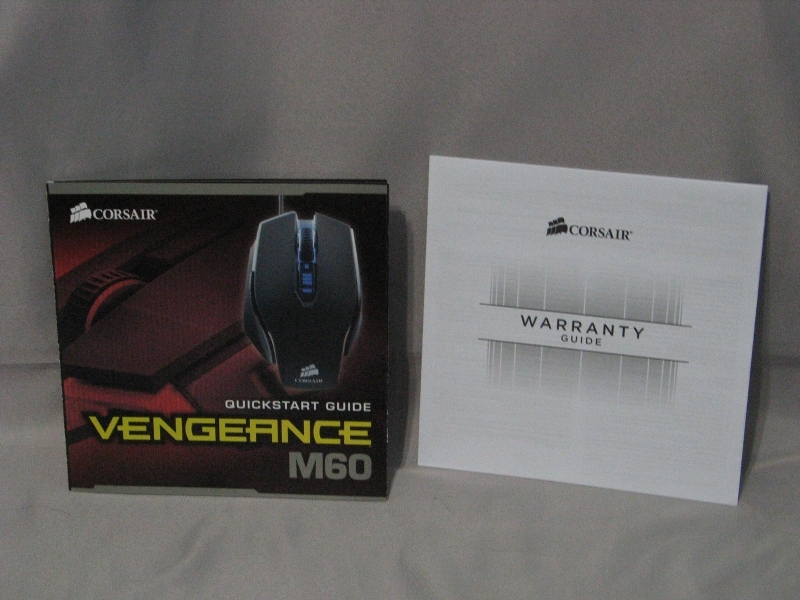 Note that there is no driver CD included in the packaging; you’ll have to grab the drivers from Corsair’s website. Since this is what I end up having to do with most hardware anyway, the driver CD isn’t something I miss. One thing that I noticed immediately on opening the packaging was the cord. Sheathed in braided cloth, strain relief jacketing on both ends, and a Velcro tie already attached—this is how every peripheral should do it. 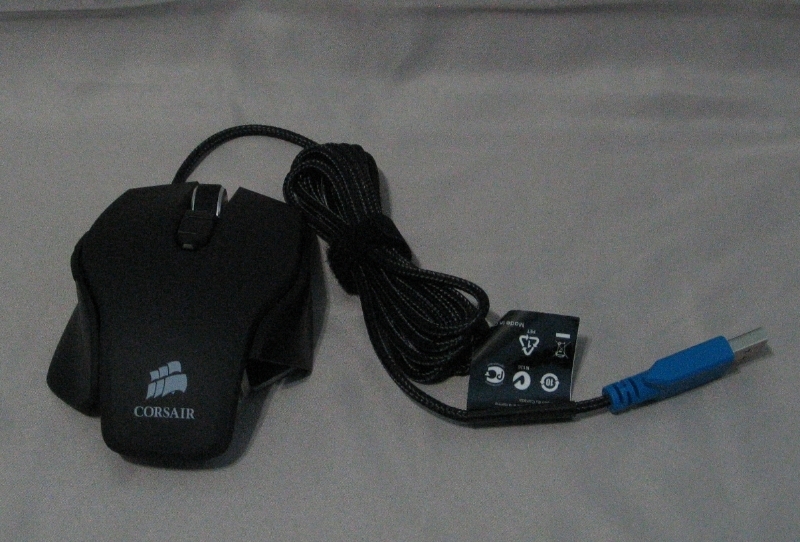 The choice of a blue boot for the USB plug might lead you to believe that this is a USB 3.0 mouse; it’s not. That would be supremely pointless; no mouse has ever needed more than the 12 Mbit data rate supplied by USB 1.1, and you’ve likely got better uses for the still-limited number of USB 3.0 ports on your machine. Looking at the mouse in profile, it’s interesting to note what parts they’ve shaved away in the name of reducing weight. The areas you’re most likely to grip, on top and sides, have a molded plastic shell, while the rest has been sliced away to expose the aluminum frame underneath. All three panels are composed of the same plastic, though the side panels have a subtle texture to them that makes them easier to grip. 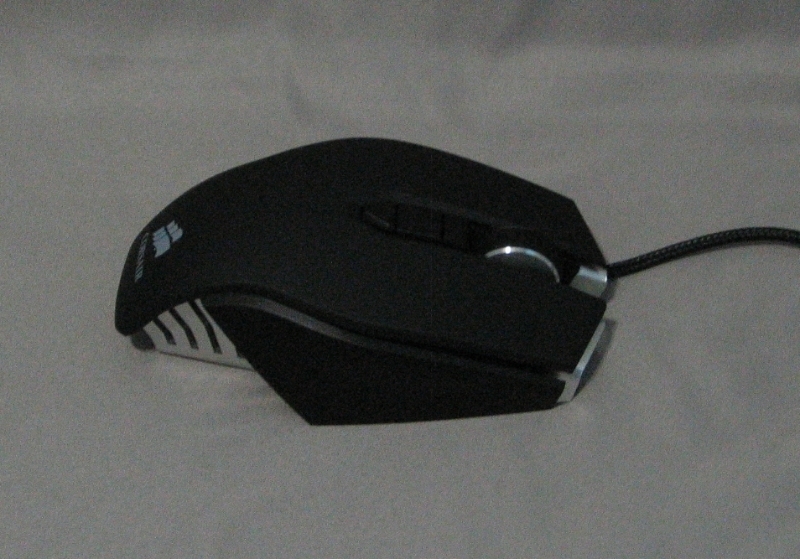 The mouse wheel is large and notchy, and has no side-tilt or other unusual features. 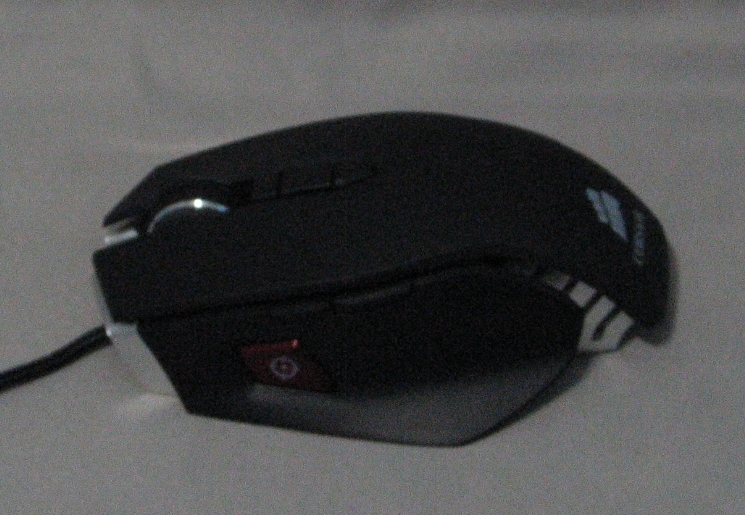 The side buttons are somewhat unusual; the back and forward buttons (mouse4 and mouse5) are slim, and positioned near the top corner of the side panel. They’re a bit difficult to make out by sight, but their shape makes them easy to feel. The large maroon sniper button is positioned about where the tip of your thumb will be when gripping the mouse. More on that below. Wait, isn’t the M65 pretty much an improved version of this? You’re right. M65 has improved DPI (8200 DPI vs 5700) and better coating. What exactly is specification different in M60 and M65?